Well everything is starting to settle into place. It's the start of third week of term. The classes are finally starting to sort themselves out and settle into a pattern. Most of them are now all established and will stay that way now until end of this term at least. I think only Thursday has yet to sort itself out into set classes. But the rest of the days are working out. I should get paid next week but I have been given some cash anyway to keep going in between. Apparently I'm not the only teacher affected, something went wrong with some of the transfers. But of course with the boss out of town nothing can be dealt with quickly making life interesting. At least he didn't forget to pay me which makes me thankful it's just something going stupid in the system. I am now working even more than I was with doing administration work 2 mornings a week and then still teaching every afternoon and Saturday mornings. As well as a couple of days working as a nanny. My life is crazy but it's starting to settle into a pattern. Though we have started looking at houses. I technically still live at my parents house but I spend more time than not at Phill's house. So we are looking for a house that is bigger than the townhouse he currently lives in. Once we have a house I can then start planning the wedding. Since then I will know how much money we actually have to spend on a wedding. Of course the money won't come much from my wages but mainly from Phill's. Without him I would have nothing much. and in between work and everything else my downtime is spent stitching or knitting. I love to stitch because it allows me to relax and stretch out. To that end I have actually been busy. This dog is almost almost almost done! The only thing left is the head :D I am so excited about finishing this. Hopefully I will have more updates after tonight. So glad things are sorting themselves out. Can't wait to see your boxers finished. I'm glad to hear everything is sorting out with your work :)Boxers are almost there,can't wait to see them finished! So glad to hear thst things are sorting themselves out. Good luck with everything. Great progress on the boxers. can't wait to see them finished! so happy that everything is sorting out with your work..
cant wait to see boxers finished..
Good to hear things are settling down. Boxers are going look so great when your finished. A wedding, how exciting! Be sure to let us know when we need to wear our virtual hats! 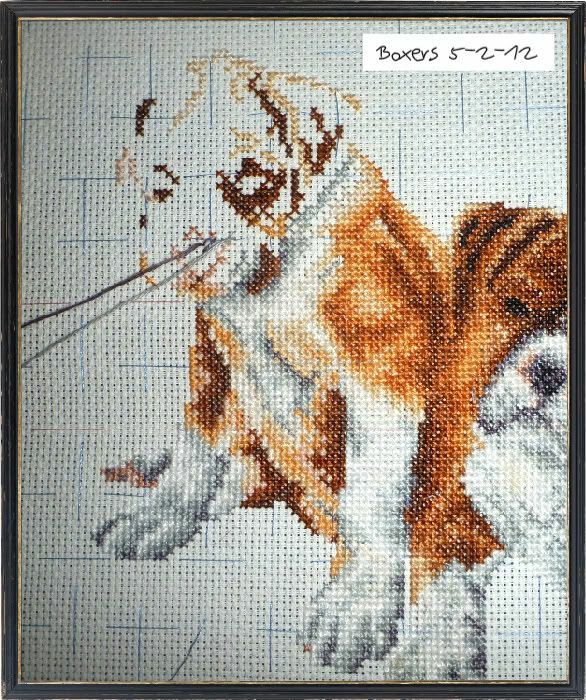 Great progress on boxers (have just seen today's post).